Like what you see in the supermarket produce section? Enjoy, because things may be changing there – the prices, even the mix of available fruits, nuts and veggies. Long acknowledged as “the nation’s salad bowl,” California’s farm belt is facing some thorny challenges from our changing climate: rising temperatures, an uncertain water supply and more abundant pests that threaten multi-billion-dollar crops. The half-hour documentary Heat and Harvest, a co-production of KQED and the Center for Investigative Reporting, examines these threats and some potential solutions. Cherries need a certain number of “chilling hours” to bloom evenly. Photo: Center for Investigative Reporting. 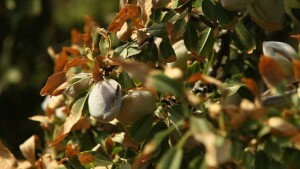 Almond plants damaged by salt in the groundwater, which burned their leaves. Photo: Center for Investigative Reporting. 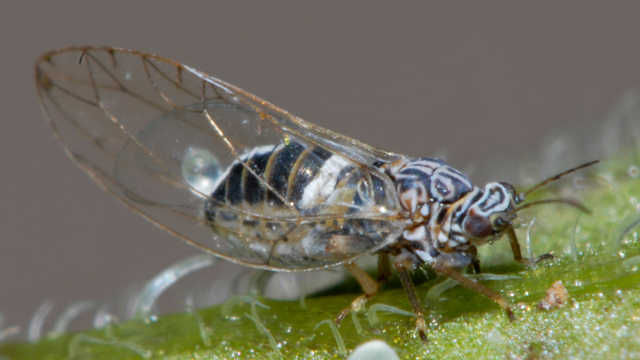 Scientists believe that warmer winters have made the potato-tomato psyllid, which damages 40 crops, more abundant in California. Photo: Gary McDonald. 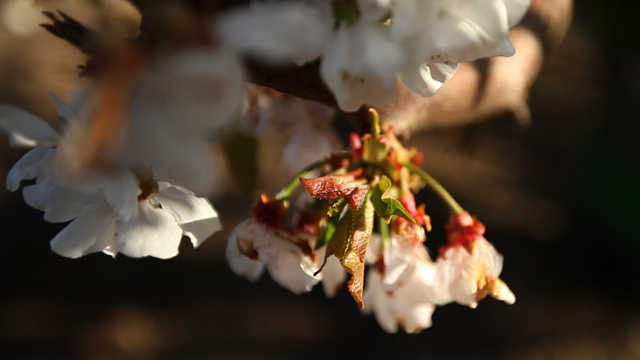 Play our water quiz and guess what California crop needs the most water. Just saw your very interesting and thought provoking show. Thank you. I’m going to share with both friends who garden and some involved in ag and water issues. We need to start switching over to drought tolerant crops. It is crazy to try to grow rice and other high water crops here now. We need to plant aloe vera and other species that can handle intense Central Valley sun and basically no water. Moreover, the more we grow and produce, the more we wipe out the other 10 million species on the planet, impact the environment, and ultimately hurt ourselves. There are still way too many of us, and we are way to consumptive. I recently finished reading Humans Need Three Hands, and that novel really opened my eyes to the idea of Homocentrism: The fact that people only care about and focus on human needs. Great book for people who care about being part of the environment; not being above it. Lemme copy em answers! Yes?